In today’s competitive market, recruiters pay more importance to work experience than on degrees when they hire people for their organizations. Studies reveal that real-life exposure to work has more impact on their job role than a degree or training undergone. It has become a must that he /she has to have a job experience in an internship in their resume. Everybody usually has certain ideas regarding work experience. But the basic concept of work experience is to understand the skill set of the candidate and also the projects undertaken by him/her in their previous organizations. The apt definition for a ‘work experience‘ is it is a period of work done in a particular organization or anything own from which learning can be achieved. Here the person would be employed for a full time in a job role. He/she would be involved in all the aspects of the job which involves more than a duration of 8 to 10 hours approximately. These type of work experience are expected in many organizations as the employee skill level would be higher when compared to others. Here the person would be employed part-time, according to the job role. These type of work experience are also expected as few organizations might have only a need of an employee for a few hours. This is common in many types of organizations like textile, and marketing, retail outlets etc. This type of work experience is where an employee owns an entire or part of a business by himself. This is also needed for few organizations where more management skills are expected. This type of work experience is commonly expected in franchise bidding, handling whole management positions etc. This type of work experience is where most students get to have during the vacation. Here the person would be employed for a short span of a few months. Most of the freshers are expected to these type of work experience. This type of work experience is where the person might not get paid for the job role player but he gets to know the work. This type of work experience is generally common between students as they do it as a part of project or internships. This is an added advantage to list in the work experience. Few organizations also consider this type of work experience too. Relevant work experience means having work experience related to the job posted. This has more plus than the generalized work experience as it gives a basic structure to your resume and highlights your skills set relevant to the job. There might be many work experiences listed in your resume. Relevant job experience will give more clarity to your resume and will add more focus to the interviewer. There might be a huge number of resumes posted for a job application. But any relevant work experience will add an edge over others and more commitment to the interviewer to review your resume. As when your resume has a relevant work experience, there are many chances that your resume gets added points and they might also consider your resume for higher job roles as already you are experienced to the relevant job posted. Employers usually prefer experienced candidates to fill the vacancies in their organization. This helps in many ways and the main thing is training which costs them a lot of time, money and resources. Hiring experienced candidates can also help the organization in many ways when compared to freshers. But from the organization’s side, if freshers are recruited, even after training, employers need to provide some senior assistance before making them work in the real time. Saying this does not mean that freshers are a complete NO in the business market. It totally depends upon the requirement of the project in hand and the need of the organization. Helps you connect with people who can guide you when required. Having a work experience is a big advantage not only to the job seeker but also to the recruiter in many ways possible. In the present scenario, having a good degree, many certifications will not help as much a work experience can do to you. Nowadays, all employers have started to seek a person who has an on-hand experience for the job role. They believe a person becomes more skilled once he is exposed to real-life work. Work experience provides job seeker many benefits, giving you skills and a good exposure that will allow a person to stand out to potential employers as well as guiding them to choose the right sector to work in. Be it a part-time or a full-time work, an experience can gain you many benefits and make you more exposed to the good talented opportunities around you. Here are few things to be noted which makes a work experience stand out than a shining degree. A good work experience will enhance the way you communicate, team building skills, awareness about the industry, enhance leadership ability, and lot more. It will make you a master of soft skills as you have a good amount of work experience. It is generally said that a person with enough amount exposure to work life will generally develop a strong soft skill ability. And good soft skill ability generally comes by more exposure to the environment. Work experience will build your confidence level as much as possible. For example, it will make you learn how to meet deadlines, basic phone and Email etiquettes, pressure managing ability, importantly people management, and time management etc. This will certainly have an impact on you and makes your more worthy. Work experience will surely enhance your application form and also during the interviews. This also has a great impact on the advantages and disadvantages of a letter of the application when applying for a particular job. This is because of real-time knowledge about the sector you have gained previously in your job. It will also make the interviewer comfortable in explaining the job role as you have experience in work life before. Having work experience will help you to choose the right organization, right sector, as well as a right shift. This is because a good experience can help you to choose things which suits your nature. For example, a person might be interested and more comfortable in working in night shifts. This can be identified once you have experimented with a particular shift in your previous organization. If things are not in your way, a good job experience will make you move in the right direction as you understand the whole process and your mind has a clarity about job life. This is the very good advantage of having work experience as it will help you have better offers than your previous employment. For example, a good reputed part-time job done previously will help you to secure a full-time job as a reward. There is a chance of improvement in your career as you move with a work experience. Good work experience will not only make you grow career wise but also it will help you to scale up personally. It will make you move higher in the scale and financially it will have a great impact if you have a good work experience. Generally, having a good work experience will make you move to the better position in the organization. People with good work experience knows how to handle people of various nature in the office. They might have overcome initially lots of people management experiences, they will have a good knowledge understanding the human mind and adapting to it. People with good experience will be exposed to lots of beneficiary plans in the new office. In order to retain them, companies will offer them many beneficial plans like good medical coverage, private provident funds, pension plans, paid leave and many more. Getting a chance of going abroad related to work is not very common in all organization. But for people with better work experience gets a good chance of going abroad related to the job. This helps you experience different work culture all over the world. A person with good experience will have enough number of skill set compared to a fresh graduate. In this case, dependency on that person might increase considerably, it will surely make them grow in the company. This type of responsibility and dependence will only be rewarded to a person who has a good amount of work experience. People who already have a work experience will be mentally prepared to handle the new work-life environment. And they generally have good adaptive skills as they are exposed to all kind of people in the previous organization. Sometimes people might choose a job to gain experience than considering the salary. It might do good for the job experience, but when thinking to shift a job it might cause a problem as any salary offer for a new job will depend upon the previous pay scale. Sometimes our liking for the new job offer or our skill might differ from the role we apply. In this case, more than an individual’s skill set, work experience on some other skill which was not our choice will be considered more than the actual skill set we possess. So, we have to stick to our previous work experience than the skill set which education provided us. Depending on the work experience skills, sometimes the number of job role we tend to apply will get reduced. Once a person experienced in few skills in the previous work atmosphere, he will be expected to only perform well in that particular skill set. So, obviously, the number of options will get reduced in choosing a job and it will affect his/her skill set in the future. There might be much higher study program available with a sabbatical. But these might be declined as experienced persons are recruited to manage the position vacant. This is one important disadvantage as it will be declined due to the experience of the person. Being an experienced person might sometime give you lots of pressure related to job goals. As an experienced person, people might expect more efficiency in terms of work, people management, and team building and many more. This is one of the disadvantages, as many people might not properly handle pressure and might lose confidence. 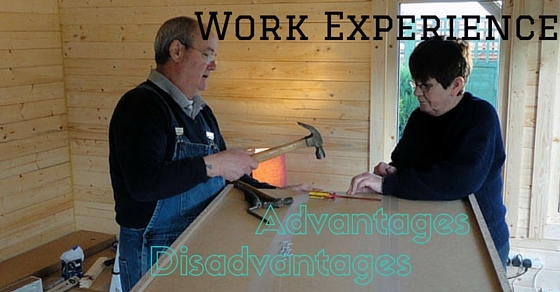 People with good work experience are often expected to handle more commitment towards the job. As they go up the scale more commitment increases and it will affect their work-life balance as well as their health. This is a very common disadvantage, as a good number of people are affected by this issue. All recruiters expect a well deserving candidate for a job opening. Sometimes when there are too many applicants many factors are considered to scrutinize the applications received. One such important factor which plays a major role in selecting a right candidate is the work experience. A recent study reveals that most of the recruiters when given a two graduated with an equal degree and personal strength they tend to choose a person who has a good work experience than a graduate with a good qualification. So, try to explore the job world as much as possible by getting into the real-time scenario.